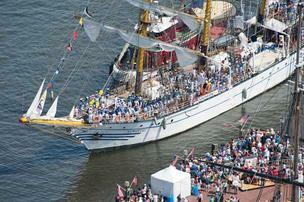 Tall ships will again visit the Inner Harbor in September for the Star-Spangled Spectacular in September. Above, a ship from the 2012 Sailabration. Baltimore’s three-year commemoration of the War of 1812 bicentennial will come to a close at the end of this summer. And it’s going out with a literal bang. Cannonfire and fireworks will pepper the conclusion of bicentennial celebrations across the state throughout the summer. The events will conclude with the 10-day Star-Spangled Spectacular in Baltimore on Sept. 6-16. Star-Spangled Spectacular will aim to build on the success of Star-Spangled Sailabration in 2012, which attracted 1.5 million visitors and left an estimated $166 million economic impact. Visit Baltimore CEO Tom Noonan said Tuesday he expects the September festival to be the biggest tourism event in Baltimore history in terms of both attendance and economic impact. Like Sailabration, Star-Spangled Spectacular will again include tall ships and air shows by the U.S. Navy Blue Angels, as well as a concert broadcast live from Pier VI and Fort McHenry to commemorate the writing of the National Anthem. Even before that, the summer will be packed with events leading up to the maritime festival. Baltimore attractions, hotels and restaurants will offer War of 1812-themed events and specials throughout the summer. Museums offering War of 1812-themed programs and exhibits include the Star-Spangled Banner Flag House, the Reginald F. Lewis Museum of African American History & Culture, the Maryland Science Center, the Babe Ruth Birthplace Museum and the American Visionary Arts Museum. Fort McHenry will host its own immersion experience called “Fort! Flag! Fire!” that kicks off June 28 for visitors throughout the summer. The programming will include living history actors, chances for visitors to unfurl a life-size replica of the original Star-Spangled Banner, and cannon firings. The U.S. Navy will provide Fort McHenry two cannons — the fort’s largest since the Civil War — to fire salutes. The Fort McHenry visitor center will also install new exhibits in July.